On paper, the pitch for the Nubia Alpha is super cool. In some ways, it's a natural extension of the idea that Apple originally tried to pursue with the first Apple Watch: that your smartwatch shouldn't be an extension of your phone but an alternative form of mobile connectivity. The version of the future that Nubia are pushing here isn't one where you own both a smartphone and smartwatch - it's one where you just own a single smartphone/smartwatch. 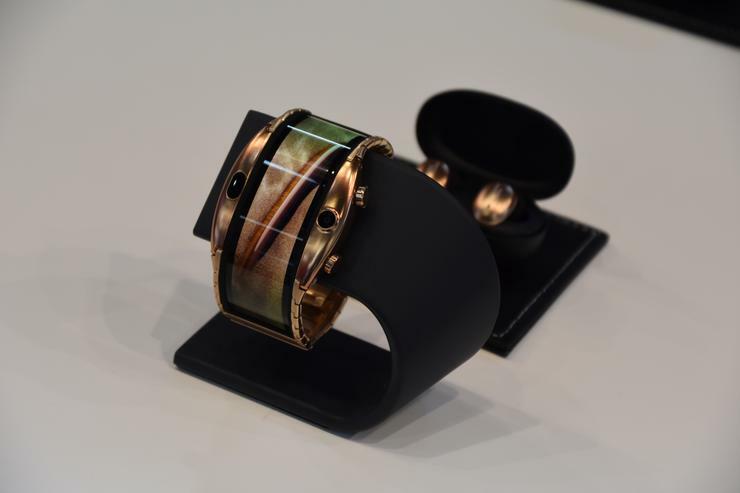 Built around a 4-inch flexible display that wraps around your wrist, the Alpha runs on a custom operating system based on Android and offers up fully-blown 4G connectivity. Under the hood, the timepiece runs on a Snapdragon Wear 2100 processor, 1GB of RAM and 8GB of on-board memory. There's no app store here but out of the box the Nubia Alpha users can play music and video content, initiate workouts, view notifications, view photos, track their sleep, pay for things (using AliPay), check Google maps and more. 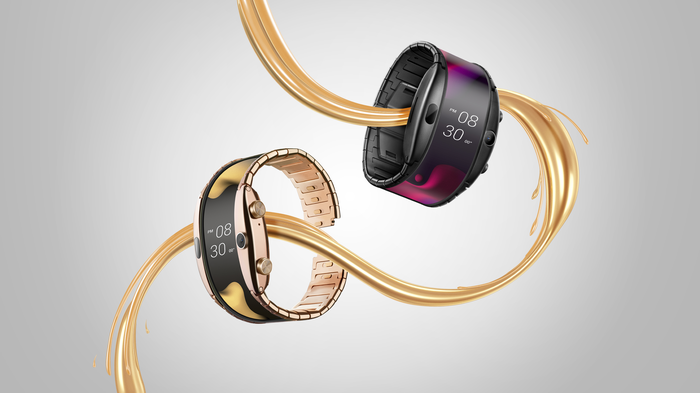 Nubia say the splash-proof wearable will be available in two colors (black and gold) and can last for 2-days on a single charge. Unfortunately, it didn't take long for the cracks to show when we went hands-on with the Nubia Alpha on the Mobile World Congress show floor. The reality of Nubia's pitch just didn't seem to hold up. First of all, the Nubia feels a little bulky - and it consistently came across as a compromise. The 4-inch display that wraps around your arm is cool in that it's unlike anything else out there. However, that's kinda the only good thing you can say about it. To the eye, it looks kinda glossy and plastic and the resolution isn't too sharp either. It's neat to have a smartwatch with a screen this big - but there's also no reason to have a display of this size. Still, the Nubia Alpha's strap design ensures it is easy enough to handle and, in fairness, it's not entirely uncomfortable to wear. Though it has a premium feel to it, the wearable also has a heftiness than I'm not a big fan of. Overall, it's bulkier than I'd like it to be. The 5-megapixel front-facing camera on the Nubia Alpha isn't particularly flattering but it does add support for a set of nifty gesture controls. On paper, these allow you to swipe between and along each of the device's wheel-like menus. In practice, our hands on found them a little unresponsive and inconsistent. The sad truth here is that, for all my hopes that Nubia's ambitious wearable would offer something different, it's just more of the same. There's not much here that you can't get out of most other smartwatches. The form-factor is a little distinct and different but the experience leaves it feeling like just another one of those. The software is surprisingly usable but limited in a bucketful of obvious ways. The Nubia Alpha's eSim-based 4G connectivity is an advantage. But then again, this quality is shared with a fair few modern smartwatches like the Galaxy and Apple Watch. The Nubia Alpha promises to offer something beyond what we know but everything about it feels familiar and unpolished. The Nubia Alpha will becoming to the Chinese market around April and then other markets later in the year. Nubia say that pricing for the Bluetooth version of the device unit would start around €449 and go all the way up to €649 for the eSim version. They've said nothing specific about Australian availability, so you'll probably have to import it if you still want one. What does this mean to consumers? That Nubia's futuristic looking Alpha smartwatch will finally be a thing you can really buy, if you really still want to and have the cash necessary to meet the high asking price.